happiness – Hi Blog! I'm Dad. I'm James Guttman, father of two children. One non-verbal with Autism and one non stop verbal with attitude. 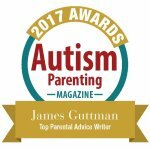 I’m James Guttman, father of two children – one seven year old (non verbal) and one ten year old (nonstop verbal). Hot Posts From Hi Blog! Then Why Do We Do It? How Can I Raise A Child With Autism? How Can That Baby Play Violin? What If There Was No Karma? What Kind Of World Am I Leaving My Kids? Does He Know It’s His Birthday? What Will People Say About My Child’s Autism?